This is the time of year when the mature buck and the seasoned bowhunter start their chess game. The deer will begin moving, but you won’t see as many deer as you do during the Pre Lockdown period. Up until this point, Mark and I rarely if ever hunt in the mornings. However, during the High Anticipation phase, we hunt mornings and afternoons. Often, we’ll hunt during the middle of the day also, because this is the time of year when bucks start expanding their home ranges. They stay on the go during daylight hours, and older-age-class bucks from other properties will move onto the lands we hunt. What we’ve learned is from the last 10 days of October, the deer move primarily in the afternoons and just before dark. During the first 10 days of November, they tend to move most often in mornings. The 10th – 20th of November is when we see the most mature bucks moving in the early afternoons. We’ve learned that the bucks at this time generally have been chasing does all night long, and they’re still chasing does when daylight comes. These bucks have expanded their home ranges, and we can often catch that mature buck going back to his bed in the early morning. By this time, the most mature buck on the property may have already bred the first estrous doe. Now he's trying to find his second estrous doe to breed. He'll also be checking all the doe trails and all the places that you’ve only see does up until this time. By checking our Reconyx cameras, we’ll see new bucks on our property that we haven’t seen all year long. If the moon is up high in the sky early in the morning, and the area you’re hunting has high barometric pressure, then we like to sit high on top of a ridge and try to spot a trophy buck going back to his thick cover bedding area. We also spend almost all our hunting day in tree stands. We’ll get into the stands before daylight and may not come out until black dark. I don’t mind sitting for a long time in my tree stand, but my brother Mark doesn’t have a lot of patience. He may come out of the tree before I do. However, if he sees that our hunting region has a high barometric pressure, the thermals are going up, we have cold weather, and the deer are up on their feet, then we’ll both stay in the stands longer than normal. 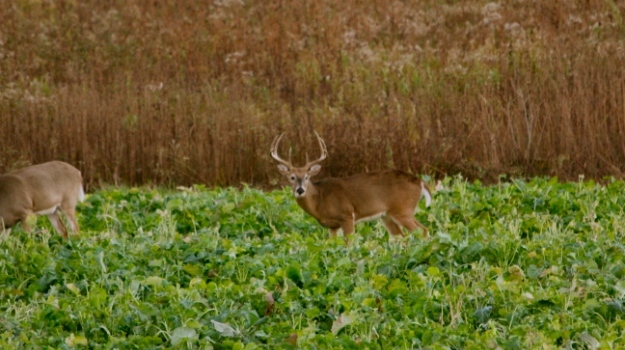 During this High Anticipation phase, bucks may have been chasing does on the food plots all night. Instead of returning to his original bedding site, a buck may decide to bed down within a 100 or 200 yards of the food plot. Then, he’ll wake up about 9:00 or 10:00 am, return to the food plot and look for does that may be in estrus. 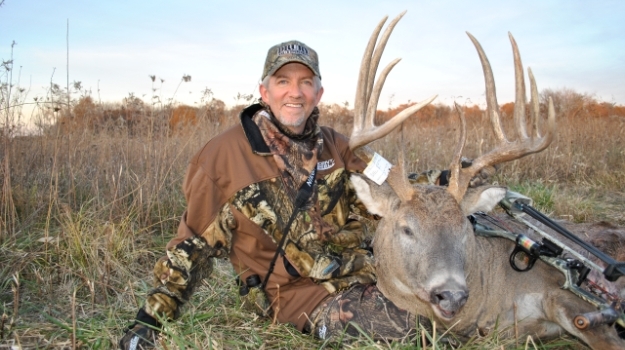 Often 8:30 or 9:00 am can be a prime time to take a big buck from November 2 – November 5. So, I advise any bowhunter or gun hunter, if gun season is in, don’t get out of your stand before 10:00 or 11:00 am during this High Anticipation period. Mark and I came up with these 13 phases of deer hunting and decided to do the TV show “Thirteen,” and boil all the information down that our research had been telling us, and the way we’ve been hunting each year to take mature bucks and then put it into 13 episodes on film. Hopefully we’ll be better deer hunters and help our viewers be better deer hunters from what we’ve studied and analyzed. Some of our dates for these phases may change for people who live in different parts of the country. However because we’ve hunted white-tailed deer all over the nation, we feel these dates, these tactics and strategies occur pretty much at the same time in different locations, with the exception of the weather. Trail cameras have changed the sport of deer hunting immensely. The trail camera gives us a better research tool to learn when, why and at what time of the year deer move than any other hunting aid we've ever had. Because of our Reconyx trail cameras we have drastically changed the way we hunt. 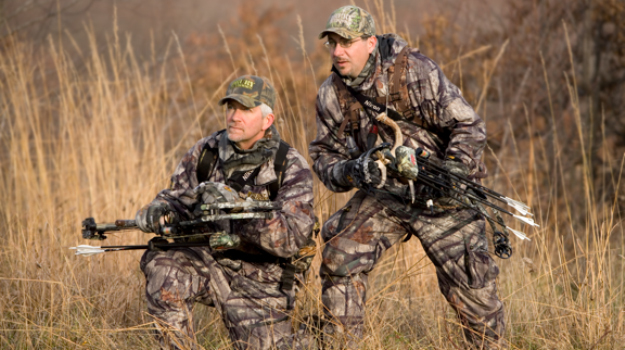 Mark and I have both invested a lifetime of bowhunting to come up with better ways to hunt older-age-class bucks, better means of predicting the movement patterns of older-age-class bucks and more-productive strategies to put our stands in the places where we feel we have the opportunity to take older-age-class bucks. The trail cameras have also given us a tool to better determine the bucks we should take each year, and the bucks we shouldn’t take. We really enjoy studying and watching the deer on the properties we hunt grow and develop antlers from 1-1/2-years up until they're 6-1/2- or 7-years old. Hunting is learning all you can about the deer you want to take with the most recent information that you can get. Harvesting one of the older-age-class deer is only a matter of touching the trigger on your mechanical release, if you’re a bowhunter, or squeezing the trigger on your shotgun or rifle, if you're a gun hunter. The majority of the hunter’s time should be spent on learning how, where and when the biggest bucks on his property move, feed, breed and bed. 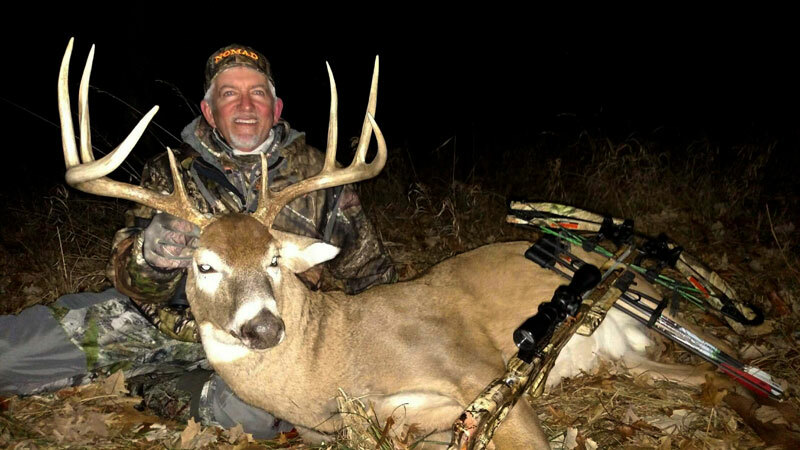 The least amount of time a hunter spends when hunting mature deer is squeezing the trigger. During this phase, if you're checking your trail cameras regularly, you'll see that daylight activity begins to pick up. 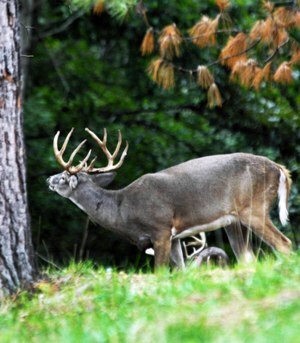 Older-age-class bucks will start moving during daylight hours. Also, at this time of the year, you'll have more solid and dependable wind direction. The bucks will come to green fields quite a bit, and the bucks are starting to scrape a little.